Many years ago I would look down from the chair lift and wonder how those folks could stand to wear a helmet. That form of head protection was just beginning to rise in popularity. A ski helmet brain trust movement was taking shape. But I wasn’t a part of it. I understood the head protection part. But I assumed that helmets were hot, constricting, and uncomfortable. And they just seemed weird out on the slopes. I just couldn’t see my way to laying out money for a “hard hat” to wear on the slopes. My wool cap was just fine thank you very much. Then my daughter Allison started snowboarding. On one of our first trips out she took a flip and whacked her head. She was wearing a helmet so she was fine. And I was glad she was wearing a helmet. Kids really should. Children, as they should, challenge authority. But then she started giving me the “hairy eyeballs” about her having to wear a helmet while I didn’t. How was that fair? Why was my brain less important? And then came the questions. And challenges. If I didn’t have to wear a helmet, why did she? Why was I such a hypocrite? I did believe helmets were a good idea for kids. Proven right by Allison whacking her head. I just didn’t see why adults needed a helmet. But I had a choice. Continue to get serious push back on her wearing a helmet when I didn’t, or change my ways to silence the onslaught. I changed my ways. Got a helmet. Wore the helmet. And I found, quite quickly, that I liked it. It was really warm, not hot. Where wind cut through the wool cap, it couldn’t with a helmet. It wasn’t constricting either. Just nice and snug. And actually, it was quite comfortable. I found that the air flow pattern built into the helmet helped keep goggles from fogging. That was a really nice benefit! We all have experienced frost on the inside of goggles, knowing that the only fix was time in the lodge to thaw and dry them out. Wearing a helmet however, kept fogging to a minimum, if it happened at all. I put a couple of brewery stickers on the helmet to give it a bit of personalized panache. Secretly, I was quite pleased with the new head gear. Then one day at Killington, over on Bear Mountain, I came up to a quick stop at a fork where the trail split. I wanted to check with my brother to see which way he wanted to go. But seconds after I stopped I found myself on the ground. He was looking ahead and didn’t see me pull up short. He crashed. Into me. Into my head. Helmet-to-helmet. I was fine. Because of the helmet. Without the helmet, who knows? It may not have been so lucky an outcome. Thank you Allison. There have been a few times on chair lifts when the safety bar coming over from the rear has rapped me in the back of the head. Especially the Snowshed chair at Killington. The helmet took those whacks. None of them were skull-breakers, but they sure wouldn’t have been pleasant. Killington seems to have something against me. Or is trying to knock sense into me. Today you see few people on the slopes not wearing a helmet. And when I see those few, I wonder why. The benefits of wearing a helmet far outweigh the negatives. At least on my ledger sheet. I’ve got a few notations in the plus column to bear that out. Helmets on the market today are phenomenal. Light in weight. Vented with adjustable vents so you can precisely apply climate control to the noggin. And they pair with goggles to keep them fog-free on almost all occasions. Personally, I like the quiet of the slopes. The click and swish of skis over snow, crust and ice, to me are a soothing symphony. Many helmets however, come with ear flaps that accept speakers so you can plug in and tune out, should you so desire. And many skiers and riders do. The past few seasons have seen a new internal “honeycomb” fabrication that is much improved for absorbing the shock associated with a whack to the skull. 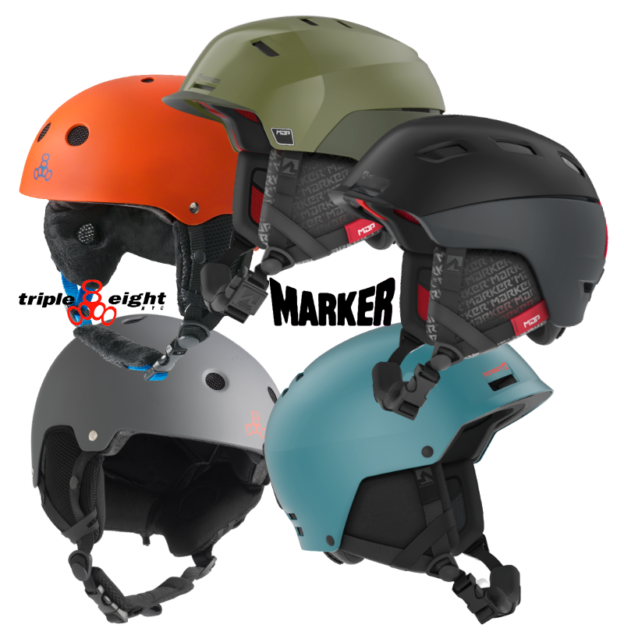 Many helmets on the market that have the honeycomb internal structure rebound after an initial hit, ready to absorb a second impact, and more, should they occur. Not such a bad thing. Given the benefits associated with helmets—warmth, goggle fog prevention, tunes, and head protection—why would you not wear one? Triple Eight helmets offer a minimalist, just want the basics, approach. But they provide head protection at industry standards. Helmets by Triple Eight are for those wanting a simplest approach to head protection. If you want the least expensive approach, Triple Eight helmets deserve a look. As one nod to “frills,” Triple Eight offers an audio version for those who want to plug in and tune out. Marker has a more expansive array of helmet offerings. From the top of the line Phoenix MAP to the no frills Clark, there is something for everyone. Even those wanting the “plug in, tune out” option. “MAP” helmets by Marker are those that contain the honeycomb-style internal structure that can handle multiple impacts. If you are looking for the ultimate in skull protection, look for the “MAP” designation on the Marker helmet. If you seek the lightest of weight, find the Marker Phoenix Carbon MAP. I swear, if you put on this helmet and leave the chin strap undone, it may just float off your head while just standing there. Seriously light in weight. Granted, Phoenix Carbon MAP is a bit pricey. But if you want a helmet you will forget you are wearing, while still giving the ultimate in protection, Phoenix Carbon MAP is it. Given that it will last nearly forever—provided you don’t run it over with the car or truck—it’s a pretty good investment. 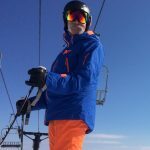 On the slopes, wearing a helmet gives me warmth, fog free goggles, and head protection. In the lodge, it’s my carry-all. Face mask, neck gaiter, and gloves all fit right into the helmet nicely. No trail of dropped gear behind me! One fine spring skiing day I decided to leave the helmet behind. It was warm and I figured it would be more fun to ski in a wool cap. Like in the old days. I put on the wool cap. It just felt weird. The wool cap went back in my pack. I pulled out the helmet and nestled it onto my head. I opened the air vents fully, and walked out to the chair lift. This entry was posted in Gear Knowledge and tagged helmets, Marker, Triple Eight on December 14, 2018 by Alan Desbonnet.